Stories reveal our common values, aspirations, and interconnectedness. They also help us to appreciate our differences. Did you know that in Madagascar ripe mangoes are picked using a long stick? I didn’t, until Mita described his first return journey to his native land and mentioned his goal to someday use a pole to pick a ripe mango in Madagascar. Though Mita was born in Madagascar, he grew up in the upper Midwest, graduated from Memorial High School, and just finished his freshman year at St. Olaf college. Mita sat at the “World” or “Whirled Table” at the L. E. Phillips Library, described his previous summer’s journey to Madagascar and learned about others’ migration stories . . . including Dave Anderson’s Norwegian ancestry. Did you know that Dave Anderson’s great grandparents’ names were Ole and Lena Olson? It’s true! 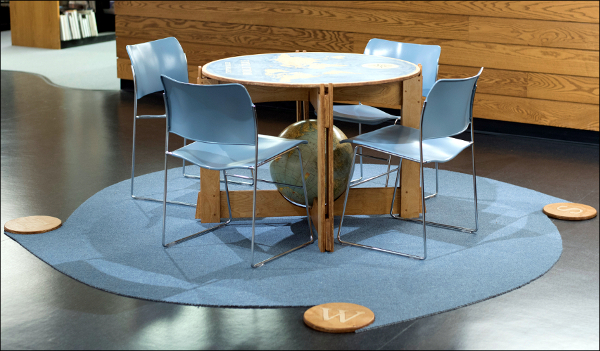 Like Mita and Dave, you too are invited to sit at the “Whirled/World Table” and share your “migration story”. The table is situated on the second floor of the library in the midst of a wide variety of summer art installations that depict the theme of “Migration”. Share your immigration story at the world/whirled table! The Whirled Table is a collaboration among the JONAH Immigration Task Force and local artists Mark Ruddy, Marguerite Gilbertson, and Amanda Korval. It provides an opportunity for us to intentionally meet others and begin to build relationships with those whose stories are different than ours. Invite someone you’d like to get to know to come down to the library and sit at the Whirled Table with you. If you don’t know how to begin, use one of the “conversation starter” options. Read or make comments in the provided booklet: Who are you? What did you learn from your conversation? Post a photo on Instagram at #WIWorldTable. Take a look at other postings of those who sat here. Use the Whirled Table to connect with members of your neighborhood, faith community, organization, etc.